On Friday 14th of April 2017 this fantastic building won Best Commercial Project Award at the Local Authority Building Control (LABC) Northern Award Ceremony. 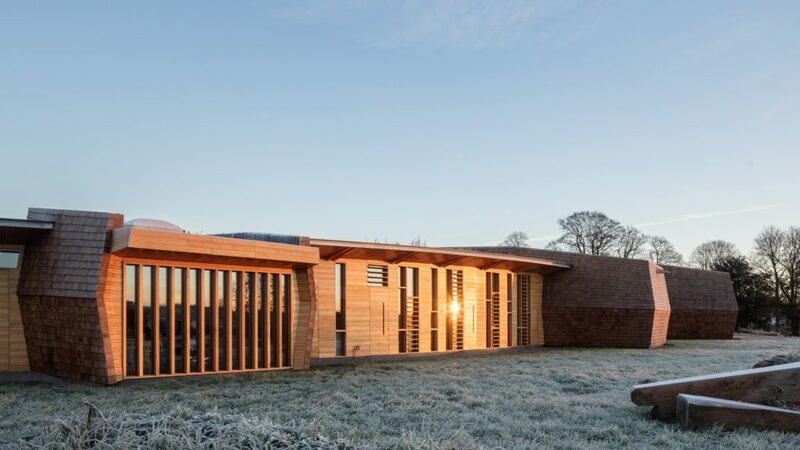 The Centre is an exemplar, zero-carbon specialist arts facility and a beacon of national importance providing the Charity with a permanent base to operate. Annie Mawson’s Sunbeams Music Trust provides interactive therapeutic music sessions for disabled children and adults across Cumbria. Sessions improve their quality of life and self-esteem through the creative freedom of Music and our Music for Life, Music for Health and Music for Dignity. The Sunbeams Centre is a single-storey construction, built into a sloping site, designed with both accessibility and sustainability at the core of the process. The building comprises specialist performance hall and therapy spaces, administrative and meeting/conference facilities. Particular attention was paid to the design, in response to the extraordinary landscape and the nature of service delivery including the needs of other Arts organisations and disabled beneficiaries. The architecture embodies the natural context, a contemporary vernacular and musical union. BIG congratulations to Annie and all the design team involved.